Tyrus Miller breaks new ground in this study of early twentieth-century literary and artistic culture. 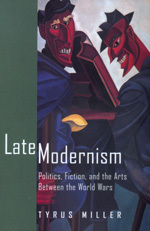 Whereas modernism studies have generally concentrated on the vital early phases of the modernist revolt, Miller focuses on the turbulent later years of the 1920s and 1930s, tracking the dissolution of modernism in the interwar years. In the post-World War I reconstruction and the worldwide crisis that followed, Miller argues, new technological media and the social forces of mass politics opened fault lines in individual and collective experience, undermining the cultural bases of the modernist movement. He shows how late modernists attempted to discover ways of occupying this new and often dangerous cultural space. In doing so they laid bare the ruin of the modernist aesthetic at the same time as they transcended its limits. In his wide-ranging theoretical and historical discussion, Miller relates developments in literary culture to tendencies in the visual arts, cultural and political criticism, mass culture, and social history. He excavates Wyndham Lewis's hidden borrowings from Al Jolson's The Jazz Singer; situates Djuna Barnes between the imagery of haute couture and the intellectualism of Duchamp; uncovers Beckett's affinities with Giacometti's surrealist sculptures and the Bolshevik clowns Bim-Bom; and considers Mina Loy as both visionary writer and designer of decorative lampshades. Miller's lively and engaging readings of culture in this turbulent period reveal its surprising anticipation of our own postmodernity. Tyrus Miller is Assistant Professor of Comparative Literature, English, and Film Studies at Yale University.